The Odyssey Simulators are a set of dedicated online grids devoted to contemporary art and performance with a focus on performance art. 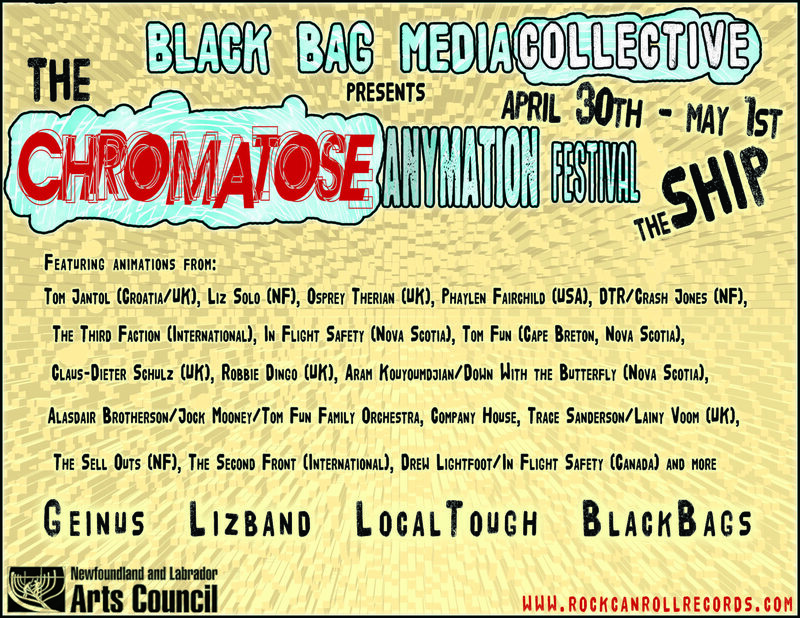 The Black Bag Media Collective took over management of the simulators in 2012, taking the reigns from other artists – a series of whom have run the sim since 2005. Currently the Odyssey Simulator in the online world of Second Life provides studio and presentation space to artists from around the world including The Avatar Orchestra Metaverse, The Second Front, Alan Sondheim and is home to The Velvet live DJ Bar. 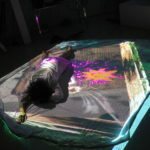 Odyssey also hosts exhibitions, performances and installations by contemporary artists. 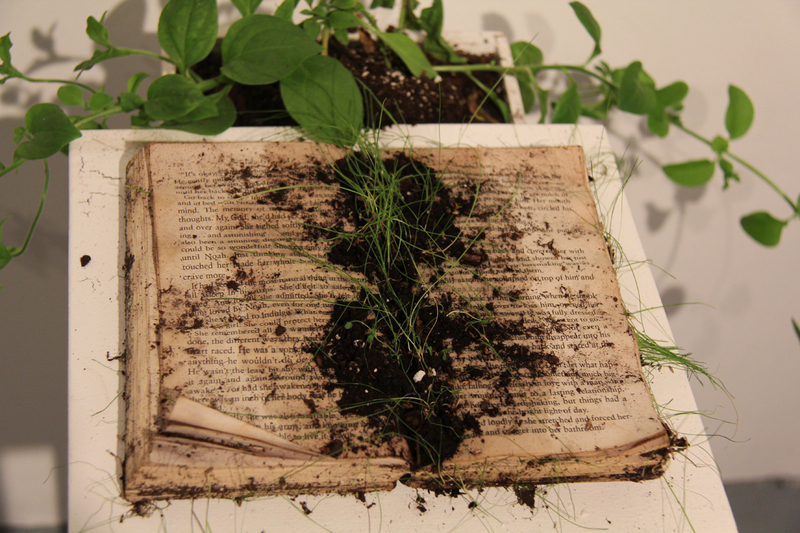 Most recently installed on Odyssey was “Too Many Flowers” by the artist Nebulosus Severine. Stay tuned for announcements of new programming coming soon. The Odyssey Simulators also include online spaces on the independently operated macGRID simulation research network by MacMaster University. Stay tuned to The Black Bag Media Collective website and the sims’ website Odyssey Simulators for news of upcoming events and happenings. Every year or so The Black Bag Media Collective collaborate with Roles 4 Women to present TrixXxieFest – a pop up festival highlighting women in media and performance. This super fun event presents rock shows, local and International films, videos, performances and New Media work curated by the punk rock band TrixXxie, who are also the founders of the event. The second very successful TrixXxieFest took place in St. John’s at the LSPU Hall June 24 – 35, 2016. The BBMC operate out of a media production studio in Toronto and a research/rehearsal space in St. John’s. BBMC spaces are used by BBMC members and associates to research, develop and present new work. These photos by Justin Hall are from our inaugural performance in the space Upside Down World by Liz Solo (CD) with Fau Ferdinand/Yael Gilks (UK) and Jo Ellsmere/Jane Leffler (USA). 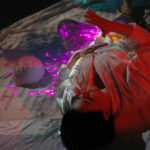 Upside Down World is a hybrid reality performance with a live performer interacting with two avatar actors in real time. 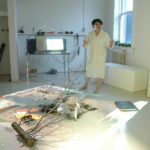 The performance involves audiences and performers in both the gallery space and the online virtual space. 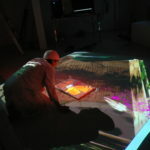 The piece utilizes live projection from our virtual studio on Odyssey Contemporary Art and Performance Simulator in the online world of Second Life and a live stream going into Second Life from the BBMC studio space. “Science and art, on rare occasions, are known to dance together. Often their affinity goes unrecognized, but in the words of Einstein: “Imagination is more important than knowledge. For knowledge is limited to all we now know and understand, while imagination embraces the entire world, and all there ever will be to know and understand”. There is a relationship of expansion and contraction, where creative thought opens a territory and rigorous experiment reveals forms and patterns within that territory. Reason gives us constants, and imagination gives us novelty. Sometimes, in extraordinary circumstances, an artful science, or a scientific art will surface. These events are often fragile, too swiftly rejected by peers, and the result of minds and efforts that have pushed themselves into a fertile, but isolated “fringe space” in order to investigate questions that have a real and lasting capacity to transform us. 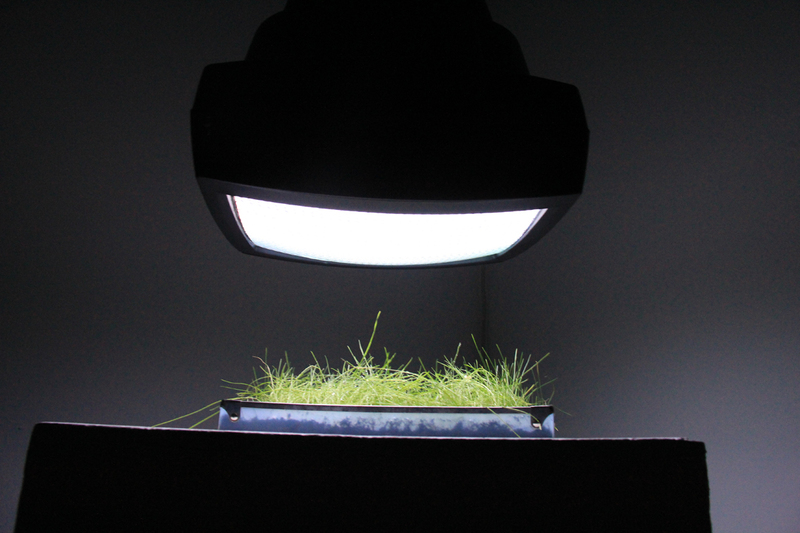 In the spirit of artscience, then, the Phytophylus Initiative asks: Do plants have emotions? Can this be measured? How can we know? Liz and Jesse are not the first either to wonder this, or to test for it. Cleve Baxter, an American polygraph expert, opened a watershed when he decided to test out a lie detector on a houseplant. In multiple, controlled experiments, he showed that plants would register reactions to the unstated intentions of persons around it, were upset by the termination of living beings, and would even respond to a “surprise party” happening for their caretaker in another city! 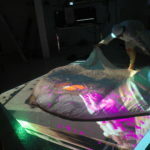 “Quite simply, Anymation is the embracing of any and all available tools in order to create a digital expression. The spirit of Anymation is not a rejection of any one of the tool-centric genres, nor is it a desire to reform them. 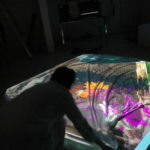 Rather, Anymation is a conscious decision to be LESS CONSCIOUS of the barriers typically seen between the different types of digital expression, coupled with a “renaissance man” kind of willingness to harness ANY available tool or method to create that expression. from Tom Jantol’s Anymation Manifesto. Night One featured the North American Premiere of Tom Jantol’s “The Remake” and videos from Rose Borchovski (Netherlands), The Third Faction (International), Phaylen Fairchild (USA), Osprey Therian (UK), Alan Sondheim (USA), Glenn Gear (P.Q. ), Iain Friar/Ice Ax (UK), Colleen T. McIsaac (N.S)., Pywacket Kazyanenko (Australia), Liz Solo and Erik Hoff Rzepka (NL/B.C. ), Tom Jantol (Croatia). Night two featured the North American premiere of Liz Solo’s machine i am and videos from In Flight Safety (N.S), Crash Jones and DTR (NL), Trace Sanderson (UK), Tom Fun Orchestra N.S. 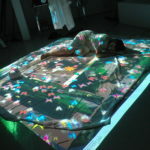 ), Down With the Butterfly (N.S. ), Jacqueline Poole (N.S. ), Jeremy Rice/the Sellouts (NL), Robbie Dingo (UK), Christopher Ball (N.S. ), Lesvatar (ON), Second Front (International), Claus-Dieter Schulz (Germay), Alasdair Brotherson (UK) and more. 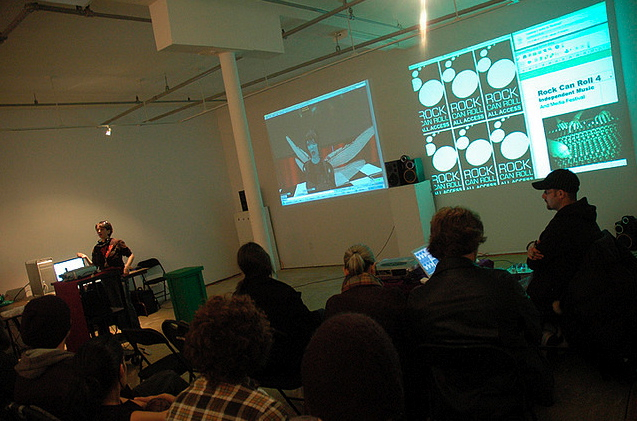 The Annual Rock Can Roll Independent Music and Media Festival was founded in 2004 by the Black Bag Media Collective (then known as Rock Can Roll) and ran for five years. The festival was designed to highlight and celebrate the St. John’s punk/rock scene, to share information and to celebrate the work of artists working in independent music and media. Each year we programmed a conference to happen within the festival. Each Conference had a different theme: Distribution and Dissemination, 2005, D.I.Y. Practice in 2006; Embracing Independence 2007; Exploring Innovation in New Media 2008; Preserving Our Punk Rock Heritage, 2009. Here is a partial list of the artists we have presented as part of the Rock Can Roll Festival. 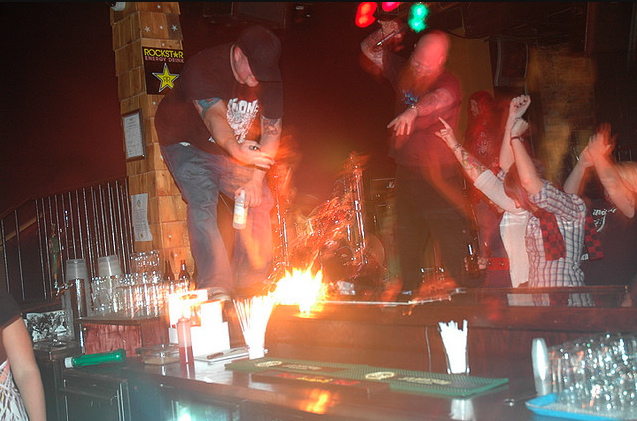 PJ Dunphy of Iron Giant (NB) lighting his guitar on fire during RCRF 4. photo by Justin Hall. The Atlantic Basin Project was an e-publication featuring the work of contemporary artists living in coastal communities throughout the Atlantic Basin and included an amazing array of work from artists working in Canada, The United States, Costa Rica, Jamaica, England, Italy, Thailand and Newfoundland. The project was generated by the BBMC in collaboration with the Independent Artists Cooperative. The First Edition was compiled and edited by BBMC/IAC member and inter-artist Liz Solo. Concept: Liz Solo, Lee Hanlon and Mike Kean. 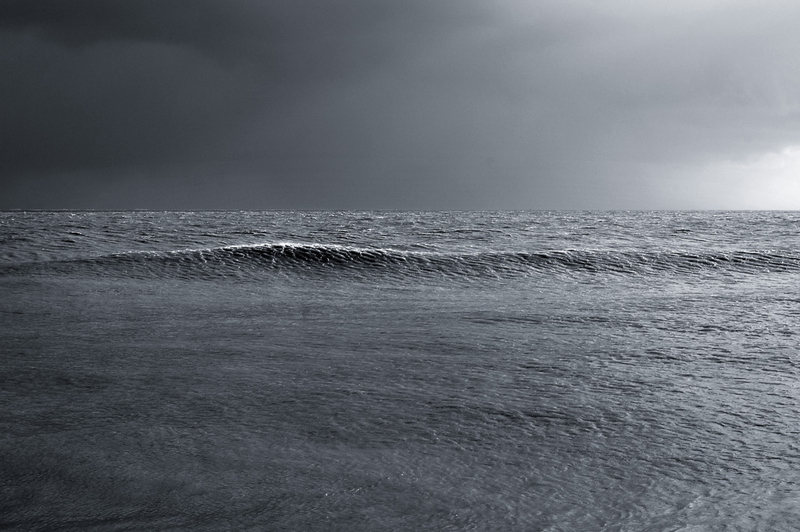 Coastal communities provide artists with very special perspectives to cast their eyes upon the world. We live on the edges of continents, related and interconnected, living close to the elements, always subject to quick changes, echoes of old trade routes a daily reminder. We experience first hand the shifts in climate and the early signs of environmental change. 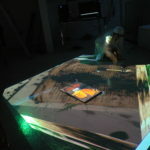 Artists working in these communities are truly living on the edge and via the technologies that now link us here offer some of their unique and often startling visions. This first edition of the Atlantic Basin Project was made possible by the efforts of members of the Independent Artists Cooperative and the members of The Black Bag Media Collective and through the generous support of the Newfoundland and Labrador Arts Council.